KP Cookie Cafe - What is Cookie Cafe? Cookie Cafe at Kings Point is a 501(c)(3) organization that is 100% supported and run by KP parents, family and friends. 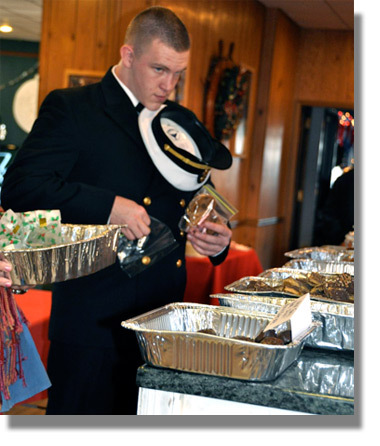 Each event brings together Midshipmen, parents, alumni and even the faculty and administration of the U.S. Merchant Marine Academy to create a friendly, relaxing environment at the school's recreation house on Thursday afternoons, starting in September. Parents, family and friends help in three areas: they donate money to provide the weekly quota of drinks and paper goods as well as fresh fruit, bagels & cream cheese and special treats; each week they bake hundreds of dozens of home made cookies, coordinated by a KP mom; and they show up at Cookie Cafe week after week spending many hours unpacking the baked goods, setting up the tables with Cookie Cafe's own specially embroidered red table cloths (donated by the So. TX Parents Assn.) and cleaning up after the day is done. But right in the middle of all that is the best part. From 1-5 pm on most Thursday afternoons (see the schedule) Cookie Cafe is open to all students who want a treat to help get them through their strict week. They eat all the goodies their hearts desire, with milk, coffee, tea, lemonade or hot chocolate. They replenish their sweet tooth, and recharge their spirits. Maybe it's belly laughing with a huge table of their friends, or talking earnestly with an adult to gain perspective, it's all about morale and showing our kids how much we appreciate them and the hard work they are doing at KP. And it's all free of charge, thanks to you. Cookie Cafe allows the mids a chance to get away from the stresses of the regimented Academy life for a little while, and provides a wonderful way for parents to support the regiment that really boosts morale. This site is to celebrate the success of KP's favorite day, and to share stories and photos. Email Leslie@kpcookiecafe.com to get on the Parent Association Sponsor or Cookie Angel list! We need and deeply appreciate everyone's help.